Born in Louisville, Kentucky on March 29, 1873, Andrew Joseph Armstrong grew up in a South still ruined by the Civil War. Although both his parents had known comfort and prosperity, Armstrong's father died in considerable debt when his son was only fourteen. When Mrs. Armstrong's health was undermined by the hardship that followed, the care of the household became young Armstrong's responsibility. A fervent Baptist, he accepted his situation and redoubled his efforts to study and keep house until he successfully graduated from high school in 1891. His love of Latin, Greek, and English made him an exceptional student. Armstrong's mother died when he was 21. He left his job in the bank (where he had worked since his graduation from high school) and continued his education, which he financed with a scholarship and part-time work. He received his bachelor's degree from Wabash College in Crawfordsville, Indiana. A temporary teaching appointment took him to East Texas Baptist Institute in Rusk, Texas, for a crucial six months (1902) during which he met his future wife. While there he also impressed Samuel Palmer Brooks, the visiting President of Baylor, the Baptist university at Waco, Texas. He received his doctorate at the University of Pennsylvania in 1908 and that same year took up a temporary post at Baylor, followed by three years at Georgetown College in Georgetown, Kentucky. The summer of 1909 was particularly significant; it was then that Dr. Armstrong made his first journey to Italy where he met Pen Browning, the poets' son. On January 24, 1911, Armstrong married Mary Maxwell in Waco, Texas; the couple's only son, Richard Maxwell Armstrong, was born on December 21. From 1912 until 1952 Dr. Armstrong was Chairman of the English Department at Baylor University. From the beginning he was a force for literature, music, and cultural experience. He was an inspiring teacher, remembered to this day for his trenchant comments and inspirational exhortations: "Don't be colorless; be somebody!" or "No man should attain his ideal—it should be his starting point for tomorrow." His own experience of life, his Baptist faith and the wisdom of Robert Browning's poetry all seemed to combine in a strong, consistent philosophy of life, powerfully influential to those who attended his classes. In 1918, Dr. Armstrong donated his small collection of Browning texts and commentaries to Baylor University. For the rest of his life he dedicated a major part of his energy to raising funds: he cajoled, challenged, and besieged donors and former students for gifts large and small. Armstrong was a kind of impresario, bringing an extraordinary range of distinguished poets, musicians, and actors to Waco and to the Baylor campus: John Masefield, Robert Frost, W. B. Yeats, Amelita Galli-Curci, Luisa Tetrazzini, Basil Rathbone, and Katharine Cornell to name but a few. And long before the travel industry developed, he was a traveler and a travel agent. He and Mrs. Armstrong arranged over 30 tours to Europe, operating from 1912 as Armstrong Educational Tours. One of the earliest "travel courses" in American colleges was offered by Armstrong, and his travelers enjoyed such experiences as an audience with the Pope and a reception in the Palazzo Rezzonico, Venice, hosted by the wife of Cole Porter. Armstrong himself traveled to Africa, India, the Middle East and South America. In short, he raised money however he could to fund and expand Baylor's Browning collection. As early as 1925, Baylor's Browning collection was clearly the largest single concentration in the world; equally clear was the need for a separate building for the vast and growing collection. In 1943, Baylor president Pat N. Neff offered $100,000 toward the construction of the library and challenged Armstrong to raise the remaining funds. Despite being faced with a post-war economy and taking on the challenge at the age of seventy, groundbreaking for the 1.75 million dollar, three-story Armstrong Browning Library was held on May 7, 1948, on the campus of Baylor University. This man of such determination and energy, complemented by his very capable wife, Mary Maxwell Armstrong, always worked an 18-hour day. 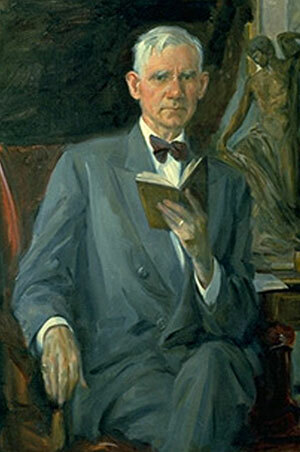 Besides Armstrong's indefatigable drive to build a Browning collection at Baylor, he had the full-time job of chairing the English Department. Weekdays as well as Saturdays were for administering to his academic duties and for his classes devoted to Robert Browning, Dante, Shakespeare, the Bible as Literature, a modern poetry class, and other special lectures. Sundays were reserved for teaching the largest mens' college class at the First Baptist Church every week for thirty years. From 1926 - 1951, time was set aside for weekly lectures to the Literature Survey Class, a group of one hundred Waco women, and, during the same twenty-five-year period, for the sponsorship and supervision of the honorary English society, Sigma Tau Delta. The group was not allowed to be "just another campus organization." The carefully chosen members were deeply involved in the presentation of poets and artists at Baylor, in the publication of lectures and other projects and of Armstrong's quotable philosophies. But primarily, the students were prodded to discover their own talents and abilities by multiple assignments to prepare a lecture or book review or some other creative work. His tests of endurance made a lasting impression on Armstrong's students, and his influence on their lives and on all the many lives that he touched is still evident today. 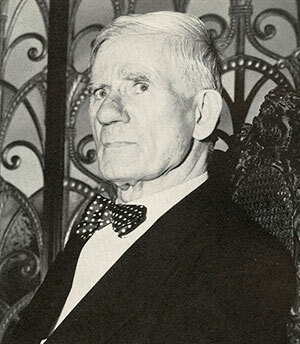 The archives of the Armstrong Browning Library preserve much of Armstrong's voluminous correspondence and other records of his remarkable life. Above all, he is immortalized by the Library building and the Browning collections it houses. Armstrong died on March 31, 1954, and was buried in the family plot in Waco's Oakwood Cemetery.